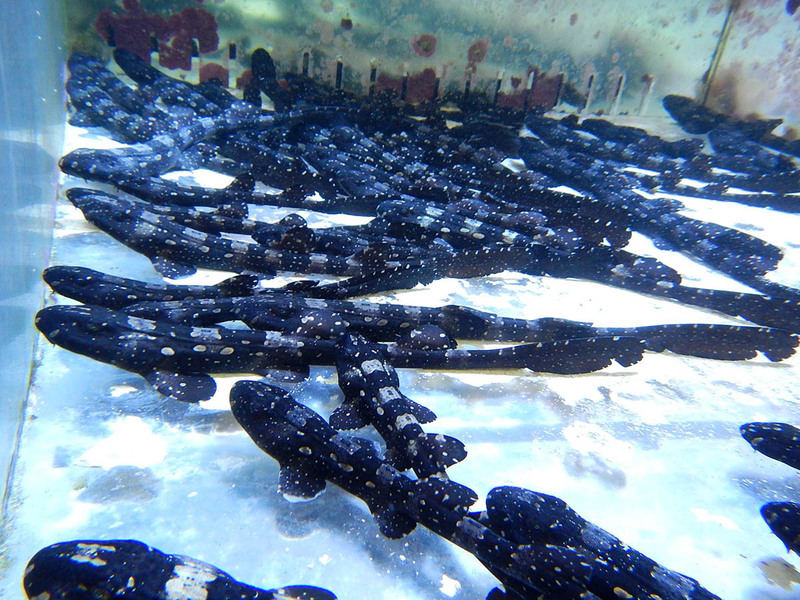 ﻿ CORAL Video: SDC - Brimming with Captive-Bred Sharks! CORAL Video: SDC – Brimming with Captive-Bred Sharks! This is just the tip of the sharknado – a swirling sea of captive-bred sharks is on hand at Sea Dwelling Creatures, a wholesaler in California. My initial response was “Holy h*ll that’s a lot of sharks” when I saw the above image posted on Sea Dwelling Creatures Facebook Page. But then, then, someone posted this video of “feeding time” (you can bet the cloudiness is the result of all the “chum in the water”)! I should point out, SDC labels these as “Tank Raised Marble Cat Sharks”. Trade names are notorious for telling only part of the story, and this is simply nothing new. 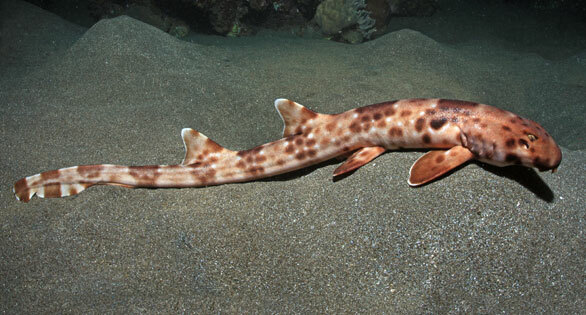 These sharks are also known as White Spotted Bamboo Shark, Marbled Bamboo Cat Shark, Bluespotted Bamboo Shark, and probably a few other permutations. Regardless of the common name, Chiloscyllium plagiosum is a very common shark offering in the marine aquarium trade. It is rare though, to see them labeled as “tank-raised” or “captive-bred”, and thus, we generally would assume the fish offered are wild collected. “I think we got 200 [sharks] this round,” responded Cohen to my inquiry about just how many sharks are there whirling around those tanks. He elaborated that this quantity, this level of captive production, is not unusual whatsoever. ” We have been getting supply like this for about 4-5 years,” said Cohen. These sharks are perhaps being undersold by SDC; while being called “tank-raised”, they meet the strictest definitions of captive-bred. The sharks are the progeny from large captive holdings of adult sharks, and at times come from more than one facility. With multiple sources, and a number of broodstock animals involved, it’s possible that there is a pretty solid gene pool in captivity for this species, and that getting a pair of captive-bred sharks from a place like SDC won’t necessarily result in pairing brothers with sisters. Of course, when talking about shark care, I must make the obligatory remarks to thoroughly research the long-term needs of a shark before acquiring it. I’ve found SharkRayCentral.com to be one of the better resources in that regard; I’d recommend reviewing their care sheet on C. plagiosum. I should point out that recommendations do vary; eg. many websites suggest a 180-gallon aquarium is a suitable long term home for this species, while I’ve found SharkRayCentral to be much more conservative in that regard, citing surface area recommendations of 38 feet to 55 feet, and gallons ranging from 570 to 800, for single fish / pairs respectively. Regardless, it should be known that a shark like this can grow almost a foot in their first year of life, may live to be 25 years of age, and can reach lengths of just over 3 feet. Bottom line, that 40 breeder you may put them in now is a very temporary home. But if you want to try your hand at keeping a shark, I can’t think of a better way than starting out with one that is captive-bred – there’s certainly no shortage if you know where to look!